The Circus is coming to town! Children love the smells, sights and sounds and rides! 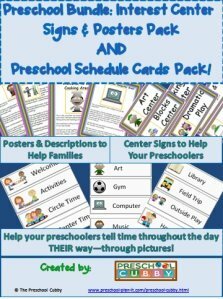 This Circus Theme page includes preschool lesson plans, activities and Interest Learning Center ideas for your Preschool Classroom! 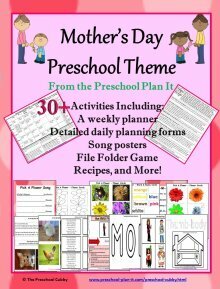 You can either scroll down through this page to see all of the preschool activities for this theme. 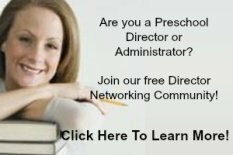 Or, you can click the picture link below to go to specific preschool activity types you are looking for. In advance, cut eye holes in paper plates. Provide crayons for the children to decorate their face masks. Attach a large craft stick for the children to hold the mask to their face! Give the children miscellaneous craft supplies and glue to decorate their wagon that will transport a specific animal. EXTENSION: Cut out pictures of animals for the children to glue on their wagon once it is decorated. Children tear tissue paper and use liquid starch to glue the tissue paper onto the plastic wrap. Add a variety of blocks to your unit blocks. The colored, cardboard blocks that look like bricks are great for this theme as well as adding small, colored wooden blocks. Add small plastic animals and you will be surprised at what the children build! Make flannel pieces or clowns on paper with sticks to hold them with that match the ones in the following poem. Give out the flannel pieces or stick clowns before reading it. I make enough for every child to have one. You could also make enough for half the class to have one and then read the poem twice! This little clown is happy and fat! This big clown wears a big red hat! This happy clown is strong and tall! And this tiny clown is the silliest of all! 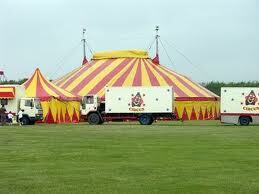 Look at pictures of circus acts and talk about what the circus performers can do. Then ask the children to reflect--what is THEIR special talent or skill? Of course! Bring in an air popper and make popcorn in your classroom! Add melted butter, parmesan cheese or other toppings. EXTENSION: While the popcorn is popping, give the children white lunch bags/sacks to decorate for their popcorn! 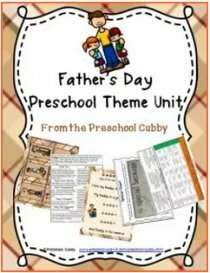 Setting up your dramatic play area for this theme will be limited only by your imagination! Turn a box or small table into a ticket booth; tape jump ropes on the floor for the children to balance on; provide themed stuffed animals for the children to train; provide extra chairs for the "audience"; hang a parachute over this area to set the theme! Easel: Balloon Painting - Instead of paint, put out three cups of colored water--red, yellow and blue. The children brush different colors on their papers to create different colors and different balloon shapes. Let the children play a ring toss game. They are pretty inexpensive at toy stores. VARIATION: Have the children toss the rings (or balls) into a bucket. Red balls or rings into a red bucket, blue into blue, etc. In advance, make a large clown or animal with its mouth open (cut out mouth area). The children toss the bean bags into the mouth. Hang a colorful parachute over your library area this week! Themed Activities to Help Your Preschoolers Develop Their Math Skills and Those Small Muscles in Their Hands! Feed the Elephants! Thank you to Eliana M. for submitting this activity! Number the elephant pictures from 1-10. Have children place the correct number of candy peanuts on each elephant. Of course, the children can eat one for a job well done! Find a picture of clowns from a coloring book or online. Make collars for each clown if the picture does not have one. Color each collar a different color or color with a different pattern. Make a paper hat for each clown, coloring a hat to match the color or pattern of each clown collar. Glue the clowns in a file folder. The children match the hats to the correct clown. From magazines or online, cut out duplicate pictures of circus related items: animals, clowns, seals, wagons, big tops, etc. You could also use themed stickers. Glue them to small cards (cut index cards into 4 pieces). Laminate for durability. The children match the cards. Music and Movement Activities to Get Your Preschoolers Movin' and Groovin'! The Circus is Marching In! Play exciting music and have a parade inside or outside! 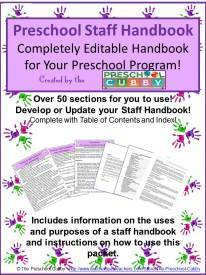 Themed Activities for Your Sand and Water Table! Place sand in your sensory table. Add plastic animals for the children to use. 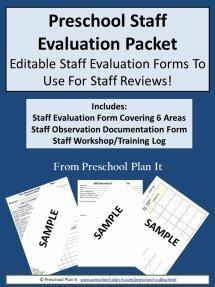 Themed Science Activities for Your Preschool Scientists in Training! Have the children help you put a teaspoon of baking soda in each bottle. Have them pour about 1 inch of vingar in quickly. YOU quickly put a balloon over the top of the bottle. The gas created will fill the balloon! Try this on your own to get the correct proportions of vinegar and baking soda for your sized bottles. Use circus stencils (make some from cardboard if you don't have any). Make shapes of clowns, horses, ringmasters, balloons, etc. The children use the stencils to make pictures that they can tell you a story about! Write down their stories.